The Baron has made you a very attractive offer. Enter his family tomb and retrieve the signet ring from the finger of his long-dead ancestor. He has offered you a substantial reward as well as the opportunity to keep any valuables you may find in your search of the crypts. It all sounds very simple until the Baron mentions that his great-great-great grandfather was also a necromancer. But before you can say another word, the Baron hands his guards a key and they lead you to The Tomb of Baron Gharoth. This solitaire adventure is suitable for a single, low to mid-level, humanoid warriorwith 30-40 personal adds. 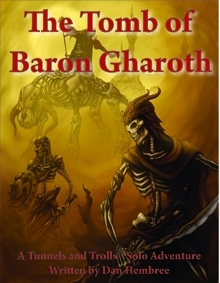 The Tomb of Baron Gharoth is designed to be played using the Tunnels and Trolls™ game system. You will need the T&T™ rules to play this game.